Another week goes by and we’re now ‘officially’ in to Q4 which means games season. Prepare your wallets! For now though, let’s check out what we’ve been up to. You can’t seem to go one day without a new Battle Royale game popping up this time it’s Stunlock Studios getting on the action with their take on the genre. 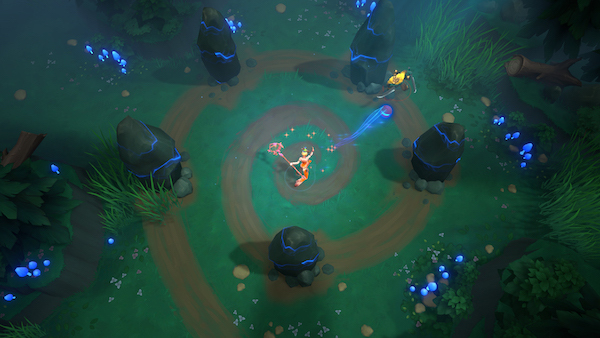 Originally a MOBA Battlerite now has its own standalone battle royale spin off and I got to spend some time playing it over the weekend. The genre is obviously very popular at the moment so in order to stand out you’re going to need to either an excellent adaptation or have something unique and interesting to offer. It seems to me that if you already play Battlerite you’re probably going to be at a good advantage as you will know some of the heroes already – I’ve not played it before, so I’m not and I found myself getting one’s behind given to them multiple times whilst I tried to get used to some of the classes. The problem with a game like this with multiple heroes that all play in completely different ways is balance. Trying to get a good balance between them all will be difficult. I can’t really say whether or not it’s unbalanced at the moment as I’ve not played enough of it, but I did notice a lot of the same heroes popping up leading me to believe they were the better ones to choose. From what I played I did enjoy it, it runs great, looks great and has a nice unique spin of the genre going for it, the fact that it’s £18 when Battelrite is free to play is a bit strange and may hinder it’s success a little, but I think it has potential and it’s nice to see someone trying something a little different. With only 30 players needed for a match it has a really healthy population too. It would be good to see another BR game stick around for longer than a month, so let’s see how it does. It is due to go free to play at a later date, but will the interest still be around by that point? Overwatch seems to be a game I will always play, but for the most part I tend to play Quick Play or random Arcade modes, I don’t tend to do too much competitive but last week I decided to get my season 12 placement matches done and I finished them with my highest ever rank of 2558 – which is just about in Platinum. I haven’t played comp since about season 9 so I wasn’t expecting it to be that high so I was pleasantly surprised. For the most part I’ve been sticking to what I seem to do best and that’s heal people, but I’ve found myself playing more of Zenyatte and Ana, I’m not entirely sure why either, because they’re probably my weakest heroes. But I feel like they’re in a pretty good place in terms of Meta so that’s probably why. But I’ve been pretty much playing whatever is needed in the team as that’s usually the best way to go I find. I play a lot of mystery heroes which is a mode where you randomly get given a hero to play each time you spawn I actually think this has really helped me with fitting in to a flex role in comp because I’m actually pretty comfortable on most heroes now. The only ones I’m not great at is Tracer and Widow. Everything else I would say I’m competent enough to hold me own if needed. For the most part I’m still able to play my best heroes, but it’s good knowing that I can easily swap it around. It’s surprising how many people you see in mystery heroes who can’t actually play well on certain heroes, they just can’t play them at all and it can be pretty hilarious to watch. I know I’m not the best player – my rank shows that, but it’s nice knowing that I can be so flexible. I’ve been enjoying Scum quite a lot since it’s release it’s been a lot of fun playing with friends and we’ve already had some pretty good, funny moments. I put together a little video from a recent session, check it out! Still, yes I’m still massively addicted to this. I’ve neglected Spider-Man and my poor Switch is just sat on my TV Stand looking at me thinking WTF? I have completed my first season in Formula 1 with Mclaren and ran riot on the drivers championship winning the title as early as Monza which is the end of August in the race calendar. The constructors championship followed a few weeks later in Suzuka where Alonso has finally been able to join me on the podium as the R&D work that’s been put onto the Mclaren has paid off wonders. We’re now into the next season and I’m still with Mclaren and 3 races in, with 3 from 3 wins. I’ve actually bumped the difficulty up again now (turns out you can alter settings during the season, I was just silly) to 50% so the qualifying is a bit more tense now. But the improvements to the car means that Alonso is now a legitimate threat to the championship and what was a one sided rivalry should make for a great one this season. I actually qualified 3rd place in the first race in Australia, with Alonso in 2nd. I would eventually go onto win the race, but it’s made the game more enjoyable again having some serious competition rather than qualifying first with relative ease. With regards to the circuits, having now raced on them all, I have to say that along with Monza and Spa as favourites tracks due to history, I’ve really come to appreciate Austria’s Redbull Ring. It’s a short track, but it’s so fast and a pleasure to drive on. I’ll stick with Mclaren for longer, with the intention of unlocking the full R&D tree across departments to build the best car on track, but I could be tempted to switch to Ferrari at some point. Interestingly enough Mercedes seem to be falling away with their updates and are now considered the 4th best team behind Mclaren, Ferrari & Redbull and Force India are making huge strides to putting Mercedes down another level. Away from gaming, I got round to watching a film I’d heard nothing but praise for and a film I had been very keen to watch, especially as we head into spooky season. I wasn’t aware of the plot to this film at all, other than under the impression that it was a psychological horror. If you haven’t seen this film and are interested in watching it, just stop reading now. It certainly is a psychological horror in the first act with some tremendous displays of a family breaking down due tragic circumstances. Then the curve-ball’s are thrown and the genre shifts significantly which I was not expecting at all. There is so much foreshadowing in this film that if you notice even in the early parts of the film, you could probably fathom out what’s going to happen very early in the film. I didn’t pick up to much of this and once the credits were rolling that’s when the light bulb moments clicked like “So that’s why she said that at that point” (trying to be vague there). The film does not hold back on it’s shocking moments with some scenes that will stick in your head for quite some time after the ending. There are some really creepy moments and the film doesn’t need to rely on jump scares to get you going. Only certain films ever make me feel hot and to honest make me sweat with anticipation and adrenaline but Hereditary certainly is one that does that. The final third of the film is pure heart in mouth and I was genuinely relieved when the film did finish purely so I could catch my breath. It would appear that I wasn’t the only person who found this as heart rate measurements taking at screenings upon launch also displayed a significant bump towards the final act. If you are into spooky films for October, you must check this film out. Watching for a first time will certainly get your heart racing.